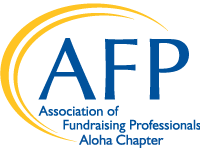 The Aloha Chapter aims to provide newsworthy updates to members and the community to support the advancement of it's critical nonprofit mission: to advance philanthropy through ethical and effective fundraising. Visit the following areas to review news and resources that shares the Aloha Chapter story to many audiences and supporters. Discover services and materials to educate yourself on past AFP activities or inspire your involvement with the Aloha Chapter in the future!